On the eve of Women’s Day, we had the opportunity to interact with a talented female coder from India, Anushi Maheshwari (5★anushi), whose coding prowess and unflinching focus is breaking gender boundaries. 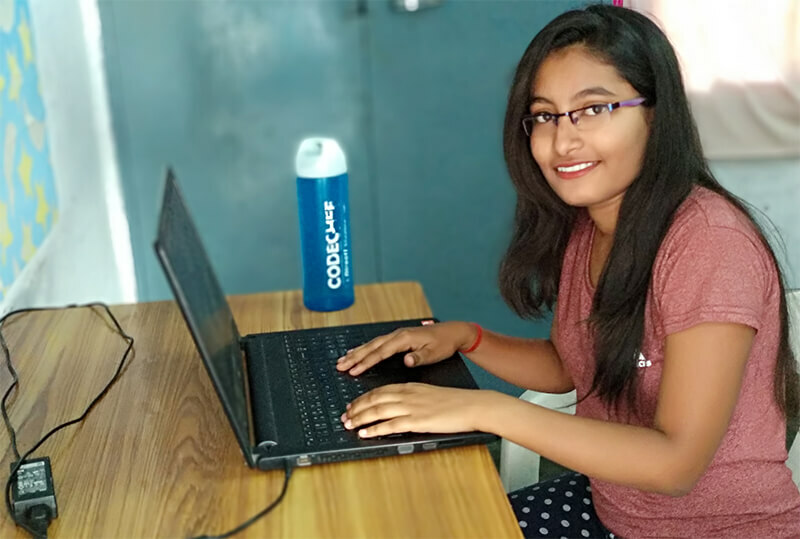 We all have a different story about how each of us started to code, and this time we bring to you Anushi’s coding journey. As a girl who learned programming skills in school, Anushi tells us of the sheer determination and hardwork that has made her achieve success in this field dominated by ‘hims’. I am a final year student pursuing Electronics Engineering at Harcourt Butler Technical University, Kanpur. When and how did you develop an interest in coding? I knew JAVA since 10th grade but because of lack of a personal laptop and an internet connection, it was very late before I started competitive coding.The first challenge I participated seriously was the October Long Challenge 2016 when I was 18 but it was during the previous year’s summer vacation when I had better internet at my disposal that I spent improving myself, actively participating in May and June Long Challenges. What sparked your interest in the field of competitive programming? I always had a liking for it. When I first learned programming, I used to think of the best way of doing that and that’s how I went forward. Later I was fascinated with the amazing CodeChef Platform. For me, the best thing about CodeChef is their long challenge and goodies I also like the concept of hacks on Codeforces. Any obstacles that you faced? The coding environment is something that hindered my growth because I couldn’t find anyone to help me with the problems I faced initially and the major reason behind this was that there were not many girl coders (and only a few boys were good in CP) in HBTI. Another roadblock was my branch (Electronics Engineering). Till today, I have a tough time juggling between the 75% attendance required in Electronics classes and my self-taught Computer Science subjects. But when so many people tackle such issues, why can’t I? It took me a while to realize that no magic is going to happen to help me understand algorithms. I had only me. I made a habit of not giving up on any topic until I understood it. I repeated read about the topic from different sources, ran that code in debug mode and saw if I made any progress. If not, I turned to messaging some great coders on Codeforces and I can bet you that 2 out of 5 are always there to help you if you ask a genuine doubt (not a problem of running contest). Your views on the gender imbalance in competitive programming? Your message to other women in the field? The best way to learn to code is solving problems. But don’t always solve easier ones, try to grasp something new with every problem you practice. For this, I think it’s better to practice those next level problems which you were unable to do in the contest other than randomly selecting by yourself. Also, you can connect to me anytime for problems you face and I assure you of my reply (It could take a day or two if I am busy with other stuff but not more than that). Her story is a simple reflection of the complexities associated with all females trying to come up in the competitive programming world and is truly an example for us all. Team CodeChef appreciates her dedication and perseverance to keep her competitive programming flag flying high amidst all the difficulties she faced and wishes her good luck in all her future endeavours. It’s Time To Make Way For More CodHers! Can’t I go on to teach it a language of my own? Coding is for the intelligent, creative, hard working individuals — male or female, yet it is an established fact that there are very less women who take it up professionally or who are interested in competitive programming. Young women across the globe are still facing a tough, rough road in the tech industry. Of the total participation at the ACM-ICPC World Finals and at the IOI, both of them known to be the Olympics of Programming, only 3% participants are female coders. On our own platform, the percentage of registered users who are women is 17%. And this number goes down further to 8.5% when we look at the rated users. Although these numbers are registering an improving trend worldwide, there is a lot that needs to be done by the community to push it further. Unfortunately, Grace is not the only one who is facing this issue. Thousands of girls worldwide have taken to the internet as a platform to share their similar experiences. Imposter syndrome is a common psychological effect that affects the top coders too. It is the feeling of not being good enough which is stereotypically imbibed in a person belonging to a group. Girls surrounded by males in a professional environment or in any competing environment crumble due to lack of confidence owing to a culture bias plastered deep in their minds. Many organizations are sprouting all over the world to find solutions and plans for engaging more females in the field of Computer Science. This Women’s Day, CodeChef would also like to celebrate the coding achievements of women on our platform and encourage more women to come and try their hands on competitive programming. We have special prizes for women participants in the ongoing March long challenge. Also, on this day of woman, we urge you to take a responsible step in empowering your fellow female coders and the entire community at large, to promise an open, inviting approach to all who would love to code. Every single one of us is part of this beautiful community, including you. Thus, we’d be delighted if you could spare a few minutes and fill out this survey about your views: goo.gl/forms/KkCTa2IjXf1YCx6B2. As you all know, Chef loves to dish out new enhancements during his birthday month, and this time, he’s cooked up something special which many of you have been asking for – a Rating Divisions system! Users are now divided into two Divisions based on their overall CodeChef rating. All CodeChef contests (Long Challenges, Cook-Offs and LunchTimes) will now have two parallel contests, one for Division 1 and another for Division 2. A user can participate in only the Division that she belongs to. The Division 2 contest will have some more easier problems, whereas the Division 1 contest will have a few more harder ones. This means that beginners get to practice on more easier problems, whereas the higher rated users will skip some of the easy problems and focus on solving the harder ones. A Win-Win situation, if ever there was one! The ratings will be calculated only within your own Division, and hence will be a better reflection of your true skill level. Also, we can now have more External Rated Contests, which will be rated only for Division 2 users. The Chef has also introduced Unofficial Participation, through which Division 1 users can also submit in such contests, but it will not affect their rating. And last, but not the least, we hope that it will be further motivation for users to improve their performance and get to compete with the elite! Head over here to know more about this system.